A squishy keyboard and trackpad mar the Lenovo Flex 2 15, an otherwise great looking 15.6-inch laptop with a gorgeous 1080p screen. In a world of tablets, light ultraportables and the thin as heck MacBook Pro 15-inch with Retina display, big laptops have to do more than simply sport bigger screens. There are fewer reasons than ever to buy a big, blocky laptop when smaller machines have gone high resolution. With tinier notebooks housing blazing fast CPUs and enough graphics power to handle light gaming, big clamshells need something extra special. Billed as the second take on Lenovo's budget home laptop line, the 15.6-inch Lenovo Flex 2 15 surprisingly misses that mark. 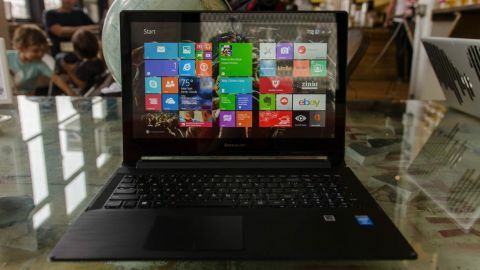 Users will find neither a top-of-the-line AMD chip like that in the Toshiba Satellite C50D, nor a dedicated GPU like inside the Acer Aspire E1, but the Flex 2 is a thin and light machine for its size. What's most unique about the Flex 2 15 is that you can flip its touchscreen back 300 degrees. It's a neat feature that turns the laptop into an oversized, Windows 8.1 media screen, but is that reason enough to go for this big lug? Compared to the Lenovo Flex 15, the sequel shares a very similar design, while at the same time looking like a downgrade in many respects. The original Lenovo Flex's orange siding, which ran around the circumference of the laptop, has been replaced with a decidedly sleeker, black look. The rubberized finish on the display's back and laptop's bottom panel have been swapped out for plain old plastic. Lastly the unit's interior panel, including the keyboard deck and palm rests, was once aluminum but now has been swapped out with brushed plastic. One would think these changes were made in service to make the laptop lighter but somehow both models still share the same 5.1 pounds. It isn't bad news all around though: a few refinements have been made, such as doubling up the number of vents on the laptop's left side. Lenovo has also cleaned up the display bezel into one simpler, albeit thicker, glossy strip. The original Flex design helped make this 15.6-incher look smaller than it actually was, and much of that carried over to the new revision. The dark paint job, coupled with the laptop's tapered design, is as if Lenovo draped the Flex 2 15 in a slinky black dress. Despite the thin profile, Lenovo managed to fit a host of connections, including a collapsible Ethernet port and a slim optical drive. You'll even find a tasteful power button integrated into the narrow strip along the side of the base. Getting back to the Lenovo Flex 2 15's marquee feature, you can flip the screen back so that the system sits keyboard down. It's a neat mode that turns the laptop into a dedicated media player or optimizes it for touch-heavy applications. The only knock I have against this mode is that it's only any good for a stand mode. The Flex 2 15 doesn't have any motion sensors either, to detect when it's been propped up vertically or placed into tent mode, as the Lenovo Yoga 2 11 does. If I were asked to describe the Flex 2 15 in one word, I would say "squishy". Users will encounter a noticeable amount of keyboard flex with every keystroke. This issue isn't limited to the center of the keyboard deck, either. Every key from Escape to the number pad shows the slightest bit of give under every press. The clickpad is even worse. Clicking either side requires so much pressure that the bottom lip of the surface bends and dips 2 millimeters beneath the palm rest. Even more unsightly is that the trackpad does not sit flush with the rest of the base. Instead, the lower right tip juts out just above the rest of the keyboard deck. This trackpad was also extremely prone to reading gestures from my wrist. Accidentally pulling out the charms tray became so frequent (and annoying) that I installed TouchFreeze to disable the touch surface while typing.